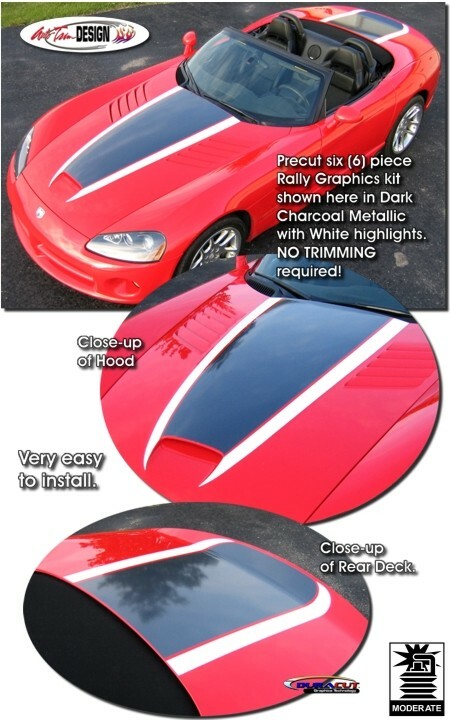 Enhance the looks of your '03-'06 Dodge Viper Roadster with this awesome and unique Two Color Rally Stripe Graphics kit. Six (6) piece kit is PRECUT and ready to install in a wide variety of colors - NO TRIMMING required! As you can see, this stripe package is not just a set of straight strips in a box. Our graphic kit consists of prefitted and contoured pieces as shown in the illustration and specifically fits the '03-'06 Dodge Viper Roadster (convertible) body style. Easy-to-install kit is provided with general online application and care instructions.